Don't play with fire — paint with it! Use Artool Flame Master Freehand Templates to airbrush smoking hot flames on tanks, fenders, helmets, murals, fine artwork, illustrations, and anywhere else you want to add some heat. 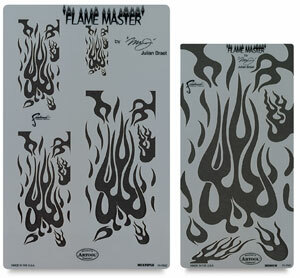 Artool Flame Master Freehand Templates are an important tool for airbrush artists of all levels. They flex and curve around irregular-shaped surfaces and clean up easily with solvents. They measure approximately 8" × 11" (20 cm × 28 cm). ®Artool is a registered trademark.® Freehand is a registered trademark. ® Flame Master is a registered trademark.